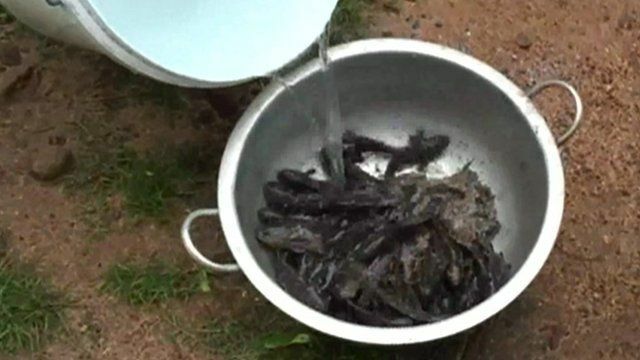 Fish rain down in Sri Lanka surprise Jump to media player Villagers in western Sri Lanka were surprised and delighted on Monday when they experienced an unusual rainfall that included more than 50kg of fish. The effect of acidic oceans on fish Jump to media player Researchers are studying the effect on marine life of the 24 million tonnes of CO2 from industrial society absorbed into the sea every day. Swimmers attacked by biting fish Jump to media player More than 70 people bathing at a popular beach in Argentina have been injured by fish related to the piranha. How do you kill a 'killer shrimp'? Jump to media player The BBC's Claire Marshall hunts the invasive killer shrimp, which is threatening British fish stocks. Watch a fish drive its own tank Jump to media player How can a fish drive its own tank? Escaped fish returns to home waters Jump to media player A koi carp fish that escaped from an aquatic centre during winter flooding has been returned to his pond after being found seven miles (11km) away. Will carp burgers take off in Chicago? Jump to media player The US city of Chicago is considering drastic measures to prevent giant fish infesting North America's Great Lakes. Villagers in western Sri Lanka were surprised and delighted on Monday when they experienced an unusual rainfall that included more than 50kg of fish. It is though the animals were lifted out of a nearby river and is not the first such incident in Sri Lanka. In 2012, a case of prawn rain was recorded in the south of the country.